Detached from the mainland, the island stands out from the sea of water. Slowly rises the sandy beach out of the waves morphing into dunes. Other places show sharp stoney cliffs reaching out of the battering waves holding the dry landmass high above. Islands show themselves surrounded otherness. They are defined by the separation of two different states of being. Prominently represented as wet and dry in the form of land and water, but it applies to other contexts too that draw a clear outline separating itself from the background. Islands have a distinct form that is defined by a boundary distinguishing inside and outside creating two bodies. Being on either side of this demarcation line is part of its identity as an island. This identity created by the boundary internally supports a cohesiveness, a sameness that identifies against the otherness outside. Through its uniformity, the form issues power and asserts control over the territory created. Islands are models of the world [German: Weltmodelle] as the philosopher Peter Sloterdijk writes in Sphären III [Sloterdijk, P., 2004. Sphären 3. Suhrkamp. pp. 311]. Such an observation is based on the fact that islands are singularities that are separated through the framing powers forming the boundary. It is the isolation that makes the island. In the way it is isolated from the surroundings it hosts an experiment of totality becoming a world-model. By framing the formation of a small world model, we imply an act of creation. Based on the Italian verb “isolare” [isolate] – we can visualise the meaning of making an island in the sense of doing. One would think of the water as the principal none subjective agent to form islands by building up sediments or volcanoes pushing out material creating islands as found objects. But are islands merely the results of mechanical processes? Besides water and other natural forces are there subjects that produce similar results? A story from the Greek Mythologies tells of a great battle between the gods of Olympus and the Titans of Mount Othrys, the old gods. The fight turned into a throwing contest of large rocks. As recounted by Danke Graves: “ Discouraged, the remaining giants fled back to earth, pursued by the Olympians. Athene threw a vast missile at Enceladus, which crushed him flat and became the island of Sicily. And Poseidon brought off part of Cos with his trident and threw it at Polybutes; this became the nearby islet of Nisyros, beneath which he lies buried” [Danke Graves, 1960 (first published 1955). The Greek Myths. Online: http://www.24grammata.com/wp-content/uploads/2011/12/Robert-Graves-The-Greek-Myths-24grammata.com_.pdf]. Japanese mythology has its own story of the creation of Japan with its many islands as told in Kuniumi (literally “birth or formation of the country”). It is the story about the literal “birth” of the Japanese Archipelago through a mating ceremony by the two gods, Izanagi and Izanami. Islands are a result of practice; they are places of both death at the end and birth as the beginning. The isolation hence is not only brought about by the sea but even more so in the form of life and death. Fast forward from the past to our modern time humans have the means and the tools to create islands. The creation of islands is a power play of politics and territorial claims. Such as it is for example currently underway in the South China Sea. See for example Derek Watkins for The New York Times, 2015. What China Has Been Building in the South China Sea. Terra-forming and land creation is a big business to exert power and influence. Islands too are created for cities in Dubai or Amsterdam. Islands are no longer found objects but made objects of the island building modernist. From finding to making implies that the islands are networked, the isolation is bridged by (inter)action. Morphosis have created the term “Connected Isolation” [Mayne, T., 1993. Morphosis: Connected Isolation. Architectural Monographs (London, England) ; 23. London: Academy Editions. ] to describe their work alluding to their efforts in planning and architecture to bridge the isolation of objects and create links to the surrounding. It is a critique of the modernist practice to isolate living through the division of function. Housing as the absolute isolation, the last island, my house is my castle, is cultivating the feeling and culture of the fencing-in of space. 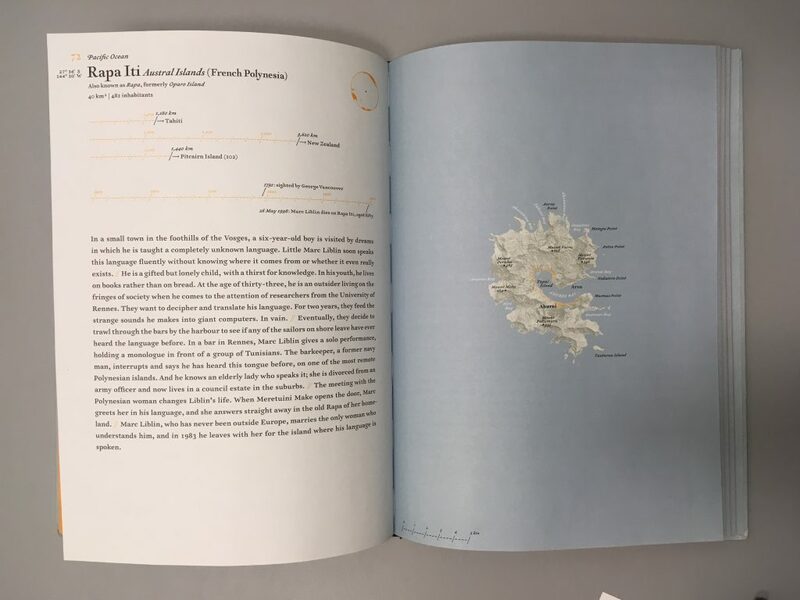 Morphosis suggests that breaking free of the shackles of modernism means (re)connecting the islands. Humans with their technology regularly create islands. However, not all human-made islands are the same. Sloterdijk distinguishes between three types of island creation. Firstly this is the detached or absolute island such as a boat, an aeroplane or a space station. This type transitions from water to air to space describing clearly the notion of isolation. The second is the creation of an atmospheric island such as conservatories or greenhouses where a kind of nature island is imitated by technical means to create specific conditions. And thirdly the anthropomorphic island shaped by the being-together of tool-wielding humans. It establishes a cradle like situation, an isolating breeding ground for society very much as a community. While the first type is static in itself, the second one focuses inwards, and the third type is focused outwards. To sustain the creation of islands, it is embedded in a range of social practices. To maintain the condition or the community creation is ongoing. In the case of the city, this is to say that everything we deal with is ultimately tied to the social and cultural practice that created it and that it is creating in turn. Image by Wolfram Hoepfner, Ernst Ludwig Schwandner, Institut für Ärchologie, Lehrbereich Klassische Ärchologie – Wickelmann-Institut, Humboldt-Universität zu Berlin. 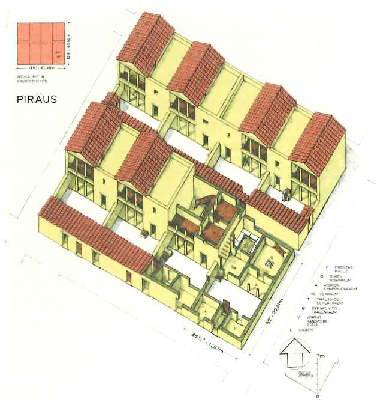 / Insula as found in Piräus with 8 house units. 5th Century BC. Reconstruction drawing. The urban island that is defined not so much by the division of land and water, but by the segmentation of land through usage, ownership, political designations, function, buildings, atmospheres, infrastructure and so on. Going back to the definitions in the Oxford English Dictionary, another meaning of island is historically tied to meaning urban block. The Latin form of “insula” was long used by the Romans to describe a block of houses surrounded by streets. It was however invented as a planning instrument much earlier and applied for example by Hippodamus von Milet while planning the city of Piräus. This block, usually eight houses, is surrounded by the flows on the street. It is the static home, versus dynamic traffic or private vs public. The city is a conglomerate of a vast number of diverging interests and practices. This cacophony of activity keeps the urban fabric in a state of constant change and transformation. Layer upon layer of development forms the evolving identity of place. The city, in turn, is shaped ultimately by the social and cultural practices it enables. Within the city, some interests often start alining to assert greater power. Such an alignment can be based on interest, function or location. Communities are formed as smaller units within the larger city because their members have overlapping interests. An important factor is of course location or proximity, but it could be economic or social benefits that bind communities together. Translating these communal interests onto the land means creating some kind of boundary, to occupying this territory by creating an urban island. This territory becomes the identity and is the source of power and control. The same concept that leads to the creation of territory from each community can be scaled up to the city itself. To control and plan internally the land is broken up into manageable chunks – communities, a perspective that leads to a range of additional questions for planners. What is the nature of the unit we are working with, who is pulling strings, how is power distributed and is everything as it seems? On the other hand, even within the islands, social practice, everyday activities and physical structures lead to the creation of distinct places, some of which themselves wield enough power to create their own identity and form an island of their own. We want to call them Objects. Such objects mainly come to life through their capacity to map memories and project desires. Larger than life, these are the drivers for the islands created by Situations through practices. To sum up, the city can be visualised as a set of islands stacked and enclosed on different scales like Russian dolls. Each with its own set of Objects and Situations asserting the power to form a territory. The question now is, however, what happens along the boundary lines and in between the islands? Is there such a thing as the in-between and who shapes it and what qualities does this space have? There too must be ways of exchange some form of trade, traffic and overlapping interests across these borders. Just like a living cell structure, there are ways and means to mitigate this hierarchical structure in the no-mans-land between land and water, between same and otherness, between the form and its context. This text appeared in the handout for the DS19w Design Studio Handout for the advanced professional planning studio at University of Calgary, Faculty of Environmental Design in the winter term 2019.